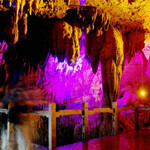 The Fengyu Cave (丰鱼岩) has an entire length of 5.3 kilometers and a subterranean river of 3.3 kilometers. The underground river is inhabited by the Fengyu (blind red fish). 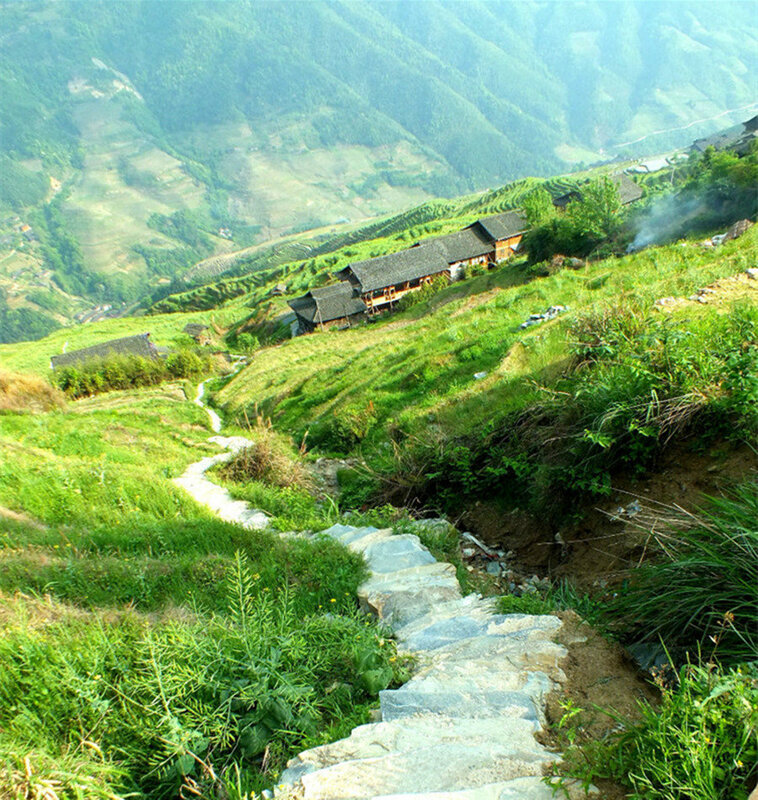 The subterranean river descends from a surface stream, 3 km away from the Fengyu Cave entrance, which originates from the southern sandstone the Dayao Mountains (大瑶山). The river enters the cave between a boundary of sandstone and Devonian limestone. 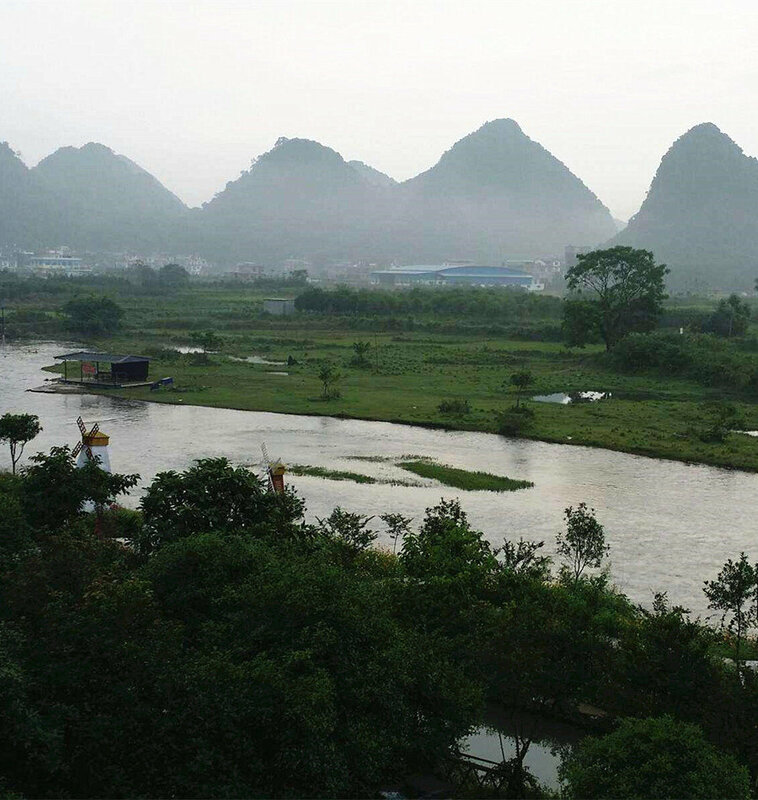 The Sanhe River (三河), a tributary of the Lipu River (荔浦河), recharges the subterranean river by karst fissures, increasing the discharge in small increments. 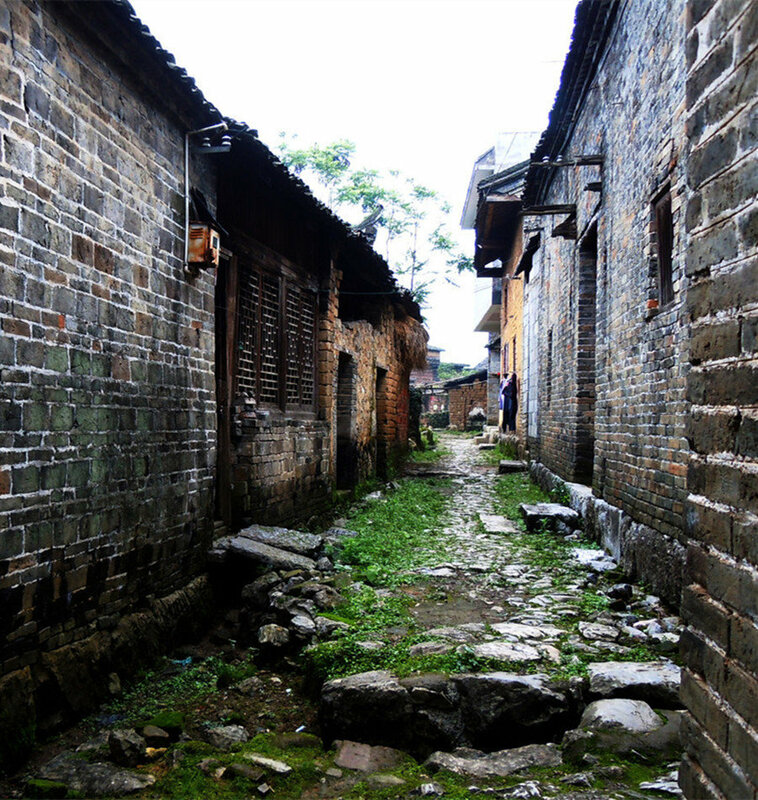 As a seasonal river, the Sanhe is flooded in the summer and almost dry in the winter. Sinkholes on the surface also recharge the subterranean river. The subterranean river is daily traversed by tourism boats. 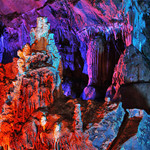 The lighting effects make this “a mystical tour” for the tourists, as they meander through a paradise of stalagmites and stalactites. The cave is 5.3 km long, running through nine mountains with one hall being as large as 25,500 square meters. It is said to be the No. 1 Cave in Asia. This cave can be explored by a combination of land, water and air. 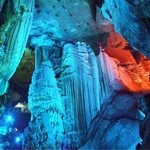 The land section is a 2 kilometers long tour revealing stalactites, stalagmites, stone curtains and stone pillars. The water part is an underground river running into the mysterious cave. 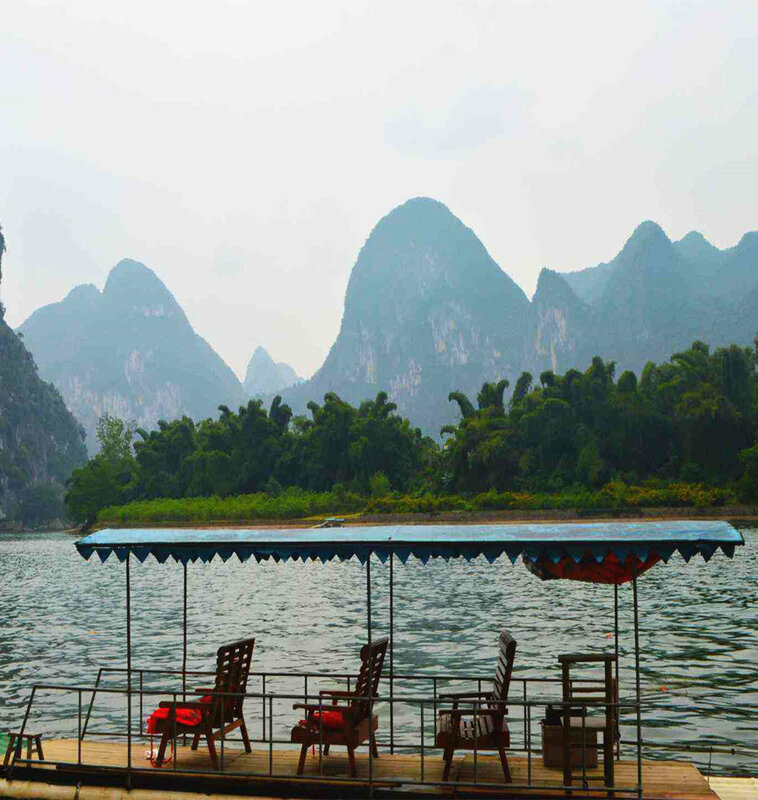 This part is about 3.3 kilometers long with numerous bizarre rocks by the river, some of which are shaped like birds and animals. The air section is a 1.8 km long overhead railway. It connects the entrance and the exit of the cave and gives a birds’ eye view of the surrounding countryside. 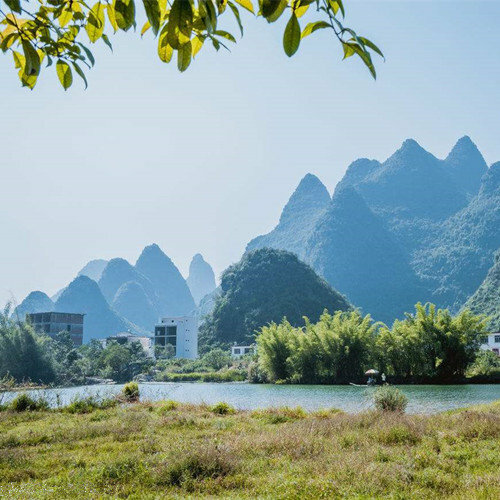 from Guilin…If you stay in the Guilin City, take a direct shuttle bus from the Guilin Bus Station (桂林汽车站) to the Lipu Bus Station(荔浦汽车站). 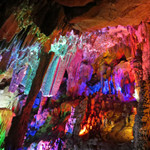 Then, take a bus to the Fengyu Cave. 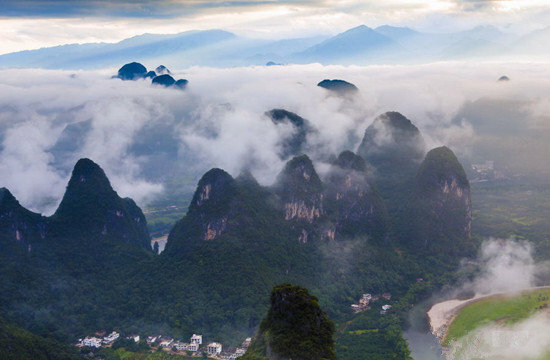 from Yangshuo…If you stay in Yangshuo, take a bus from the Yangshuo Bus Station(阳朔汽车站) to the Lipu Bus Station. 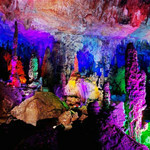 Then, take a bus to the Fengyu Cave.